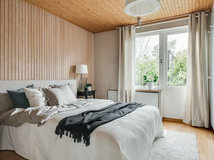 What is the proper way to decorate a bed? How many pillows is appropriate? How many is too much? What size of pillows are best? Do I have to have a coverlet and a comforter? These are all questions to consider when decorating our bedrooms. Obviously, the answers depend on the style of the bedroom, and your personal aesthetic and preferences. But here are some simple principles to keep in mind. 1. All components of a well-appointed bed serve a function. 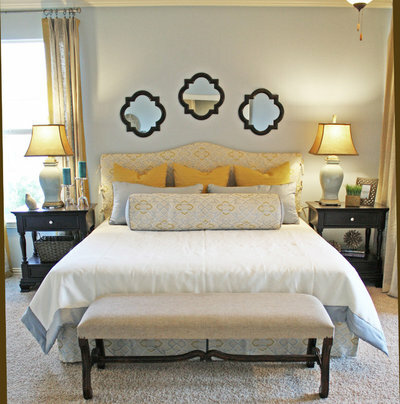 Our starting example shows all the important components: decorative pillows, a coverlet and a comforter. Decorative pillows can also be used for additional support while sitting up in bed to read. They would be used behind the night-time pillow to ensure they don’t get dirty. The coverlet is usually a lighter weight blanket or quilt (of sorts) used on a nightly basis. The comforter would be used on chillier nights. 2. Biggest to smallest, back to front. This simple rule ensures that the selection of fabrics and colors of the decorative pillows are all highlighted. 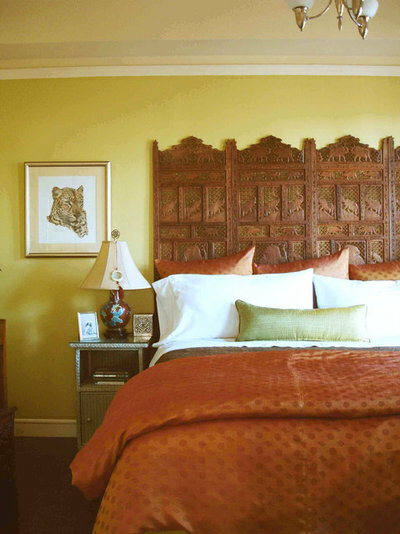 This African-inspired bedroom is casually elegant with its carved panel headboard, prairie-grass colored walls and saffron fabric. A single spring green bolster tops off layers of simple white pillows in front of pillows with a subtle pattern. 3. Vary the sizes, colors and textures of decorative pillows. 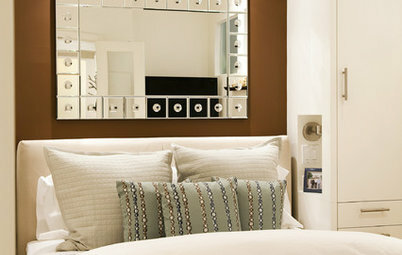 Even though there are a total of 7 pillows on this bed, the different sizes and colors provide interest and variation. In this contemporary master retreat, all pillows except the two smallest decorative pillows are solid fabrics, keeping the overall look from getting too busy. Notice how the decorative pillows pull colors from around the room, giving them purpose. 4. Play with color and patterns for a more casual look. Simple, clean white bedding is offset with a highly patterned coverlet for an artistic feel. 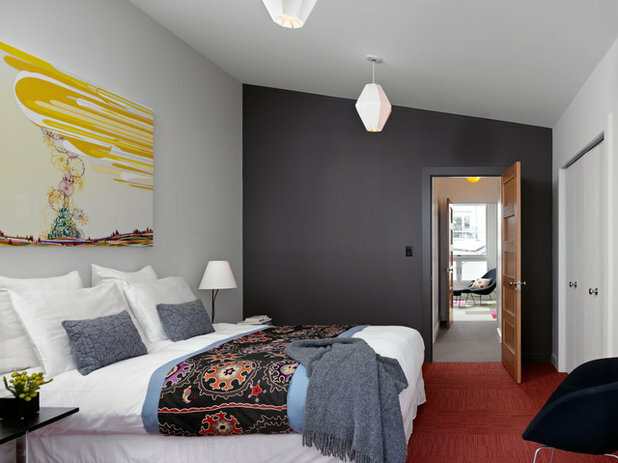 In this modern room, the palette is simple: grays and white, with strong punches of color. 5. For a more contemporary look, pare down the decorative pillows, but attend to the details. I want to stay in this room so bad! It has that high-end luxury hotel feel that we all strive for. Again, simple white linens, a luxurious throw at the end of bed (I really want this to be cashmere) and one simple decorative pillow completes the look. The straightforward palette is sophisticated and calming. 6. Consider a bedspread for a truly tailored look. Best described as simple, elegant and tailored, this bed is a lesson for us all. 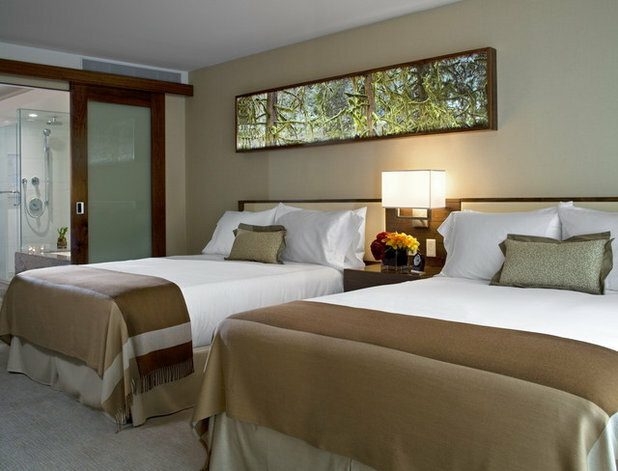 The subtle stripe in the bedspread and upholstered headboard create a luxurious yet cozy environment. 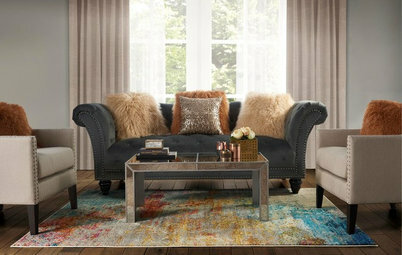 I love how the faux fur pillow brings in a bit of whimsy and contradicts the sleekness of the rest of the decor. 7. Play with pillow placement and shapes. For a twist, rotate the back pillows so they are on the diagonal. Adds an interesting little detail, different from the norm. The zebra print definitely adds a great touch. 8. Use decorative pillows to tie it all together. Here's another simple palette of taupe and white, with a little color thrown in. 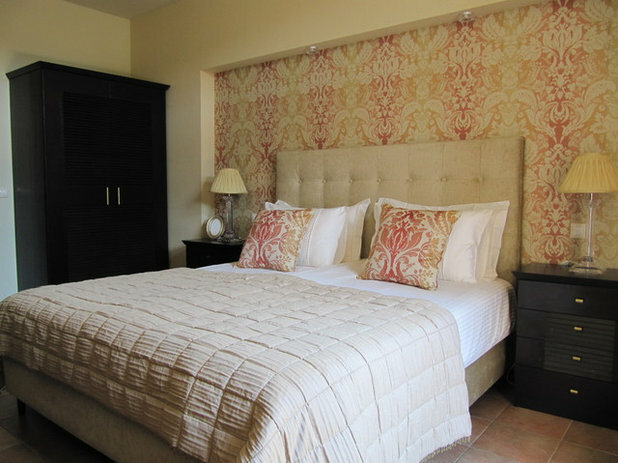 The printed wall covering behind the bed is brought onto the bed with pillows out of the same fabric. A completely cohesive decorating scheme. The lemon yellow pillows and printed bolster pull the colors and patterns from around the room onto the bed. The details are abundant in this example. Blue welting on the bolster matches the blue frame on the duvet cover. The bedskirt is out of the same fabric as the headboard and bolster pillow. The quatrefoil shape of the mirrors is replicated in the patterned fabric. A truly stunning example of how to tie it all together. 9. If you want numerous decorative pillows, use a limited palette so it doesn't overwhelm the room. 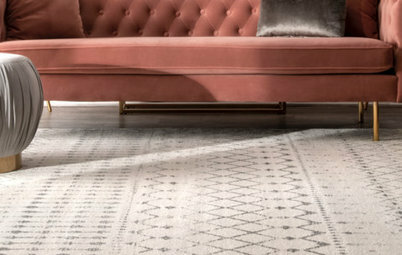 In this contemporary room setting, the tonal variations of gray create a sophisticated palette. 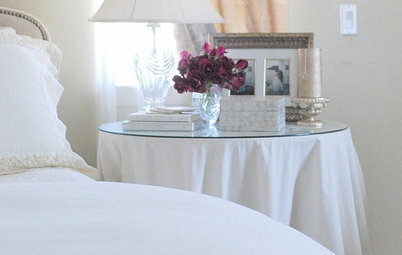 Even with 9 pillows on this bed, a duvet cover and coverlet, the dressings don't overwhelm. While not for everyone, it does create a beautiful bed. What's your idea of a well-dressed bed? lymie2long replied before I had a chance! A fitted sheet is the best thing I've seen. Make sure to pull it tight. Since there's one side that doesn't show, probably the top where the headboard is, you can pull the sheet snug and use upholstery pins on that top side to keep it tight without showing anything. I found a gorgeous piece of remaindered upholstery fabric once while traveling. It was one of those happiest of finds, I wasn't looking for anything, just happened to see it and immediately knew it would look perfect in my bedroom. Problem was, I didn't want to reupholster my chairs and while standing in my room, looking around, it struck me: it would be a perfect box spring cover! I just folded it under and pinned all around-you can't tell it wasn't made just for that purpose! There is no function to having a dozen pillows piled on a bed. Homegoods stores perhaps show this to sell pillows but in my opinion it is an absurd (and recent) affectation. The worst thing is fussing with all those stupid pillows when you are tired and just want to go to bed . . . or. There is usually no place to put them. I like to have a blanket on top of the sheet, not just a duvet which can be HOT, especially if the bed is shared with another body giving off body heat. A bed should be comfy when you are occupying it, not when you are just looking at it. What does one do with all the decorative pillows when using the bed to sleep, or the sofa to sit on?